Pictured (left to right): Dito Butigieg, Resident, McPeak's Assisted Living; Diana McCluskey of Wantagh, Mr. Butigieg's daughter; Katherine Sheridan, Resident, McPeak's Assisted Living; Charlotte Corrado of Holbrook, Ms. Sheridan's daughter; Dennis McCluskey, Ms. McCluskey's husband. 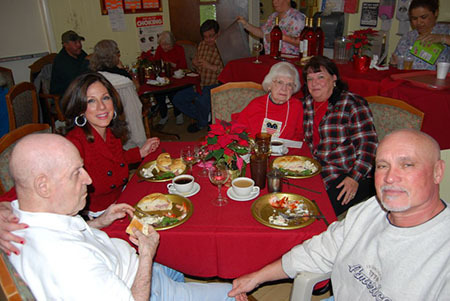 More than one hundred people came out for McPeak's Assisted Living's annual Christmas party on December 14. Residents and their families enjoyed lunch, dessert and live music. Santa Claus also stopped by to hand out presents to all of McPeak's residents. It was one of the largest turnouts the facility has ever had for the event. "The Christmas party this year was spectacular. It brought joy to the residents and to their families," stated Linda Ohlsen, Activities Director, McPeak's Assisted Living. "We were delighted to see the residents in such high spirits this holiday season." For more information, call McPeak's Assisted Living at (631) 475-0445 or visit www.mcpeaks.com.